The .Master File Virus is a new iteration of the BTCWare ransomware family that has been identified in an ongoing attack campaign. The evolved threat encrypts data based on a predefined list of file type extensions and renames it with the .master extension. As usual the hackers behind it extort the victims to pay a fee in the Bitcoin digital currency. Our complete .master virus removal guide shows how the virus can be eliminated from the affected computers and all files restored. How Does .Master File Virus Infiltrate the System? The primary infection strategy used by the creators of the .master virus is the use of email phishing messages. The criminals use social engineering tricks to make the victims install the file attachments or hyperlinks containing the malware. Infected office documents or software installers can also deliver the .master virus to the targets. They contain malicious scripts that install the .master ransomware downloaded from a remote server. Malicious browser addons, also known as hijackers, can deliver the virus during their execution. They endanger the privacy of the users by harvesting sensitive data (including stored history, passwords, bookmarks and form data) and redirect the victims to a hacker-controlled site. Using such download redirects, web scripts and even ad networks the .Master File Virus (BTCWare Ransomware) can be delivered to a large number of users in a very short time. Direct hacker attacks are also possible. Hackers seek out outdated software installations and attempt to exploit the weaknesses. Security analysts detected an updated version of the infamous .master virus. The BTCWare ransomware family associated with it contains a lot of different variants that all share the same source. This new appearance shows that the criminals continue to develop the code base. Ever since its first inception, BTCWare virus ransomware was noted for its modular structure – the .master virus can easily be modified and built upon. 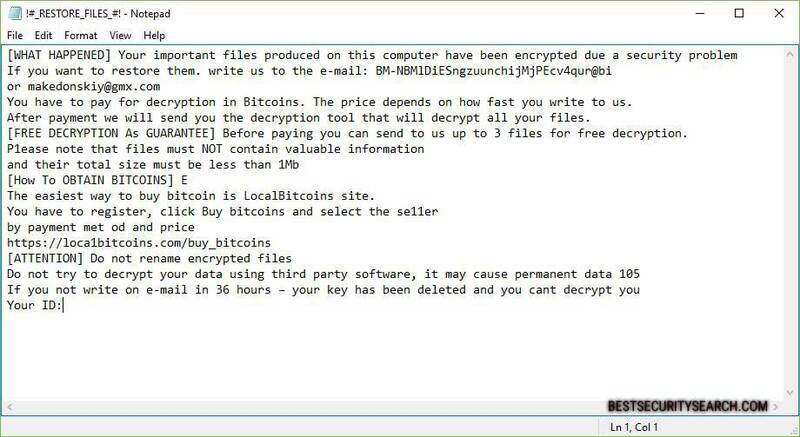 Like its predecessors, the BTCWare ransomware family starts its encryption engine after the infection is complete. It is possible that some of the ongoing malware samples can modify essential Windows files and settings. Prior BTCWare virus samples were found to modify and add files to locations including the following: %AppData%, %Roaming%, %Local%, %LocalLow% and %Temp%. Changes made in these folders can have dire consequence on the affected machines – from the loading of additional programs and malware to slowdowns and even application loading failure. The .master file virus modifies registry entries, Windows startup options and other essential configuration before proceeding with the encryption process. Some of the samples have been found to delete all found Shadow Volume Copies on the computers. This essentially prevents data recovery without the use of a high quality solution. The .master ransomware like prior viruses acts against a wide range of data – archives, backups, photos, videos, configuration files, application data, images, documents and etc. The .master extension is added to all processed files. The .Master file virus engine can also modify the extension based on a template that includes the ransomware contact address as an prefix. This means that files can be renamed with master or . [[email protected]].master for example. Your important files produced on this computer have been encrypted! The only way to decrypt your files is to receive the private-key and decryption program. The .Master file virus has also been found to delete Shadow volume copies, modify important Windows files and conduct other malicious actions as part of its behaviour pattern. Some of the prior BTCWare virus samples were found to initiate network communication with the criminals via remote servers operated by the hackers. This fact means that future or modified versions of the BTCWare ransomware can be used to steal data or remote control the machines. Refer to our in-depth removal guide to restore your computer and recover your data in a safe manner. WARNING! Manual removal of .Master File Virus requires being familiar with system files and registries. Removing important data accidentally can lead to permanent system damage. If you don’t feel comfortable with manual instructions, download a powerful anti-malware tool that will scan your system for malware and clean it safely for you. WARNING! All files and objects associated with .Master File Virus should be removed from the infected PC before any data recovery attempts. Otherwise the virus may encrypt restored files. Furthermore, a backup of all encrypted files stored on external media is highly recommendable.